The Pick a Pearl stand is located in the Mitsukoshi Department Store in the heart of Epcot's Japan pavilion. The process is simple, fun and makes a great gift for a new bride, mom, or even a little girl. Part of the fun is choosing just the right oyster, and then watching as your pearl is revealed. There is no way to determine in advance what shape, shade, or size your pearl will be, so the surprise is part of the fun of this attraction. 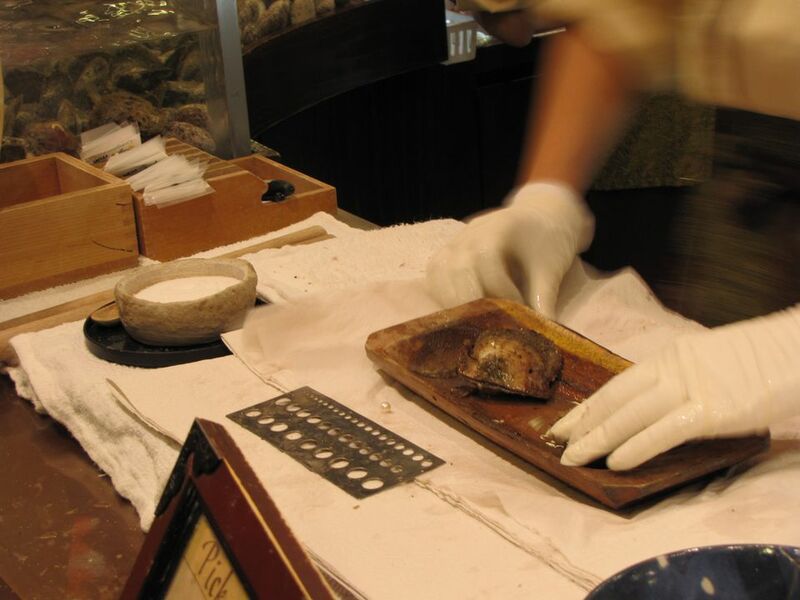 Purchase a pearl ticket at any register in the Mitsukoshi Department store. Pearl tickets are $15.95 each or about $17.00 with tax. This does not include a setting for your pearl. Select an oyster from one of the two beds at the Pearl station. The outer appearance of the oyster does not influence the size, shape, or color of the pearl it holds. The pearl station employee will cut the oyster open, revealing your pearl. Pearls will vary in size; some oysters even contain twins! The pearl will be given a quick cleaning and measured for size, then presented to you. You can select a setting at this time or take your pearl home. Settings vary in price but start at under $20. You are guaranteed to get a pearl. On the rare occasions that an oyster is empty, the customer can select another to try. Budget about $40 for a pearl in a setting if you want to take home a completed piece. Stop by the pearl station before or after a dinner reservation at Teppan Edo or Tokyo Dining.